Wow. I just...wow. Talk about a sequel. In fact, I'm pretty sure that as sequels go The Queen of Attolia should be the standard textbook in a class entirely devoted to how to write a killer sequel. The kind of sequel that will leave your readers completely unable to contain their glee at how it was just as good as they weren't daring to hope it would be. The kind that makes them keep their husbands up at night expounding upon the splendor that is such a sequel. A note on the cover: I truly love the "new" covers. I do. But this one kind of makes me want to run and hide under the covers. And I'm glad I didn't see it until after I read the book. Rather, I went in blissfully unaware of what awaited me. A note on a spoiler: I generally try to avoid them. This review, however, may have to be an exception as there is one key plot element early on that is, well, integral to everything that happens thereafter. I can't find a way to dance around it, so consider yourself forewarned. The Thief of Eddis is on a secret mission for his queen in the heart of enemy territory. As he slips away into the night, something goes massively, horribly wrong and he is run down and captured by Attolian guards. For his audacity, Attolia takes his right hand and sends him back to his queen broken and on the brink of death. While Eugenides struggles to comes to terms with his drastically altered life, Eddis declares war on Attolia for his sake and the three countries are quickly at each other's throats. As their losses mount, Eugenides realizes there is one more thing he can steal from Attolia that will save his country from destruction. But, given their last encounter, does he have the courage to venture into Attolia again and face her one more time? Truth? I spent a a fair bit of time holding back sobs while reading this book. You see I fell in love with Eugenides. And he does not have an easy time of it here. The thing is he is so very awesome that you know he'll be okay. He has to be okay. But, still, his anguish and rage are so palpable it's hard to watch. And at the same time, my favorite scenes are the beautifully alternating passages in which Gen tries and fails and tries to piece his life together while, a world away, Attolia sits on her throne, staring blankly out the window, agonizing over what she did. It's so unexpected and had me glued to the page. 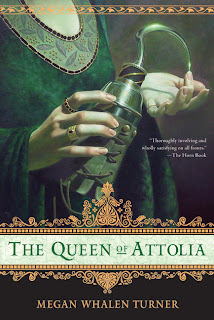 School Library Journal had a fun article on some of their favorite love stories and they named The Queen of Attolia the Best Declaration of Love. They're not kidding around. When it comes it takes your breath away. On top of it all this book's got a perfect ending. It'll make you smile through your tears. OK, You are making me want to read these books like NOW. Ijust emailed Thea telling her that we MUST. Darn it. I keep seeing books that are on my "one day I'll read that" list and then commenting: one day I want to read that. OK must read faster, one day I want to read that (I read the first one so far, but it's been so long I think I need to reread)! Ana, squee! Yes, yes, yes. You absolutely MUST. Janicu, I know what you mean. I can't believe it took me this long to read them. I'd probably reread THIEF if I were you. Or at least the last third of it, so that you're really in the zone going into QUEEN. You will love them! Em, lol. I know. I love it but it scares the crap out of me at the same time. Kind of like Attolia herself. Tell me you've read the King of Attolia? I have read KING! The review should go up tomorrow. I've held off (she says sheepishly) for the reason that reviewing it will mean it's really over. I still remember sucking in my breath at "that scene", there was a moment of horrified silence with me thinking oh no she didn't, then I did cry. Such a remarkable book-especially the way MWT redeems Attolia. Also love the "earring" scene, and how she deals with Eugenides' father. Poor Eddis, it was really moving when she called out to Eugenides just to hear him call her "my Queen" for the last time. Sigh. Can't wait to find out about Sophos. Michelle, so did I. I saw it coming and just kept shaking my head in denial. Even after it was all over. The earrings are wonderful and heartbreaking. And I loved the tension between Attolia and Gen's father. And, even though I wanted him to go to Attolia, I was not okay with him leaving Eddis. Where in the world is Sophos!? !